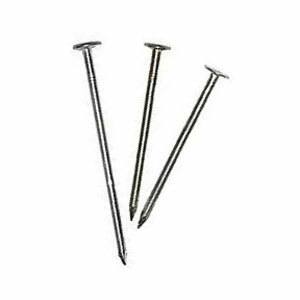 1-1/4 inch Electro-Galvanized Roofing Nail, 11 Gauge (0.120 inch) Shank, 3/8 inch Head, 50 Lb. Box. Price/Box. Packaging: 50 Lb. Box. About 10,500 nails per box.48 Boxes / pallet. Order full pallets for discounts. Meets US Standards ASTM F1667-03 and FFN-105B. Available in 5/8, 3/4, 7/8, 1, 1-1/4, 1-1/2, 1-3/4, 2, 2-1/2, 3, 3-1/2 and 4 inch lengths. Also in hot dipped, copper or stainless steel materials.